Plant Health Care Spring 2016 | John B Ward Co.
Dead Ash Tree as a result of the Emerald Ash Borer. Emerald Ash Borer (EAB) is an insect native to Asia that was discovered near Detroit in 2002. Since then, it has eaten its way south and east toward Pennsylvania, killing hundreds of millions of ash trees along the way. 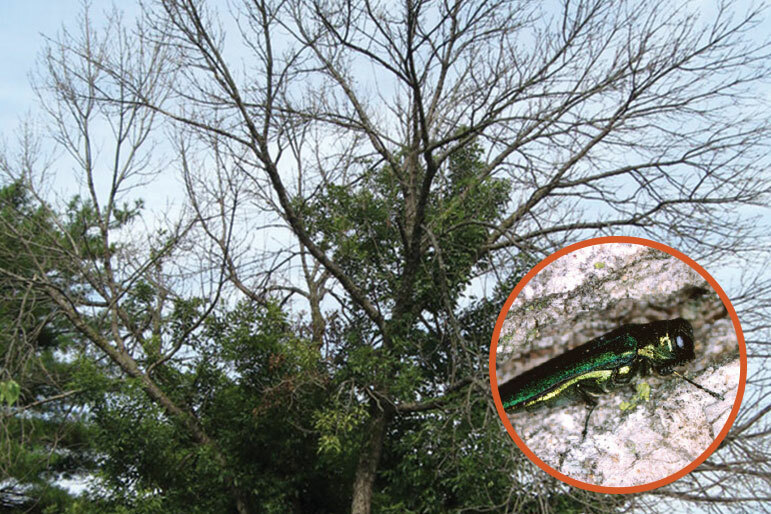 Unlike many of our native wood-boring insects, EAB will attack a completely healthy ash tree. There are known infestations in Bucks, Montgomery, Berks, and Lancaster counties, but so far, Delaware County has been spared. Control options are available; once EAB is in our immediate area, those options will become somewhat more limited and more costly. We have personally observed the infestation in Bucks County, and it is clear that once the population of EAB explodes in an area, the dead ash trees start to accumulate faster than tree care companies can remove them. That’s why we are encouraging you to protect any worthwhile ash trees this year, in order to stay ahead of the infestation. We are being proactive about EAB, and we encourage you to do the same. If you haven’t already done so, please contact us to find out how we can help you save your ash trees. Pachysandra terminalis is easily the most commonly used ground cover in our area. Traditionally, the key problems with pachysandra are Volutella, a fungus, and Euonymus scale, an insect. A third enemy, Alfalfa Mosaic Virus, was first discovered on pachysandra in 1982; we began noticing it occasionally in our area about 10 years ago. This disease causes yellow spotting and mostly aesthetic damage. Last summer, the extended dry period put pachysandra under major stress. Plants in the full sun that were not watered wilted and died. Interestingly, pachysandra in the shade became infested with two-spotted spider mites, an occasional pest of stressed pachysandra. 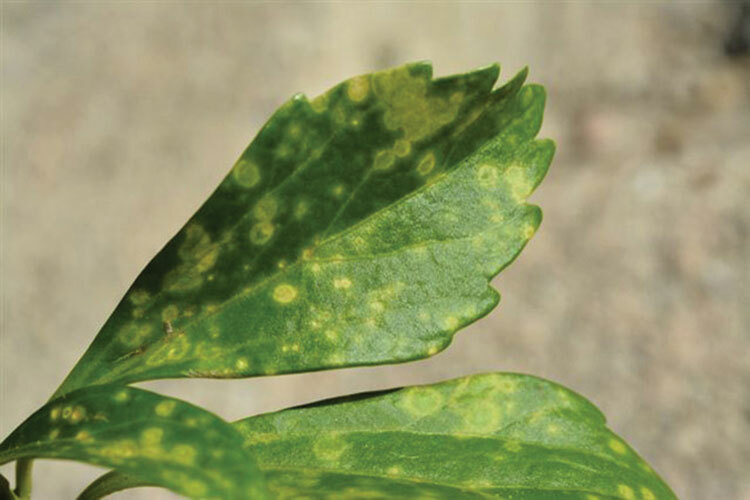 Combine these stress factors with Volutella, scale insects and Alfalfa Mosaic Virus, and we have a lot of pachysandra that is not looking its best. The good news is that pachysandra has a good ability to recover once we control the treatable problems. Let us know if your pachysandra is looking unhealthy and we will advise you on what can be done. Boxwood is one of the most valued and versatile evergreen shrubs we care for. It is great for hedging and individual specimens, has a wide array of habits and forms, and is traditionally considered to be relatively insect-and disease-tolerant. Lately, there has been a big increase in pest and disease issues associated with boxwoods. The weather may be partly to blame: the frigid winters of 2014 and 2015 killed foliage by desiccation and damaged tissue to set up plants for infections of Volutella. In addition, many new installations of boxwoods are coming from nurseries infested with boxwood leafminer, an insect that causes leaf damage and defoliation. 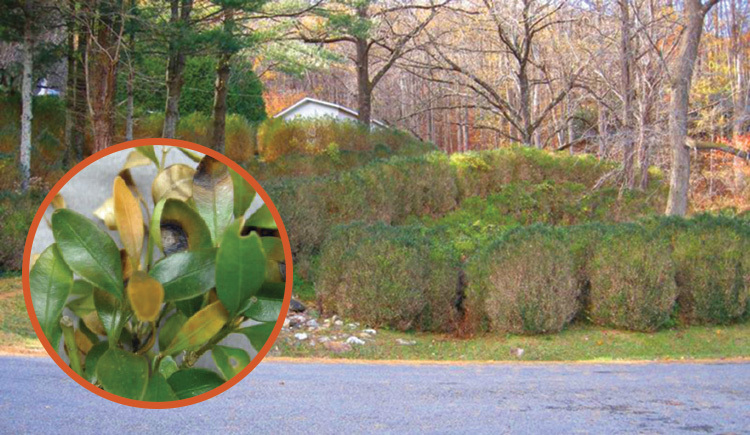 Perhaps scariest is boxwood blight, which has devastated plantings in Connecticut, North Carolina, and Virginia. It has been discovered in nurseries in Pennsylvania and the PA Department of Agriculture is working very hard to keep it out of our landscapes. It is crucial to inspect new boxwood installations. If a boxwood has suspicious leaf spotting and defoliation, let us know so we can inspect it immediately. Boxwood planting dying from boxwood blight with closeup of the leaves.